Woodbridge, VA- After a 19-hour, 22-minute rain delay that started on Friday night, The Potomac Nationals (2-2) and Lynchburg Hillcats (2-2) split results in Games Three and Four on Saturday. Both games featured comeback victories for either side, with Lynchburg taking Game Three 6-4 and Potomac winning Game Four 7-4. The P-Nats entered Saturday with a 4-0 lead after RHP Kyle Johnston (ND) fired 5.1 innings of scoreless baseball and CF Nick Banks and RF Rhett Wiseman combined for four RBIs on Friday night. LHP Taylor Guilbeau was the first pitcher on the mound for Potomac on Saturday and immediately worked himself into and out of trouble. After loading the bases on a walk, a single, and a hit by pitch, Guilbeau struck out 3B Nolan Jones and DH Trenton Brooks to escape the sixth inning jam. Lynchburg would get the best of Guilbeau and the Potomac bullpen in the seventh inning, however. 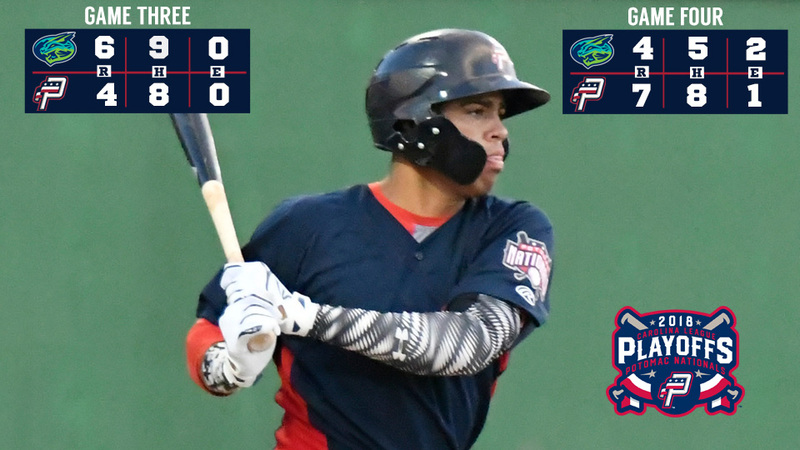 After C Gavin Collins and 1B Anthony Miller singled and RF Jose Medina loaded the bases with a walk, Guilbeau's day would end on a two-run single from SS Alexis Pantoja. With the score set at 4-2, RHP Steven Fuentes (L, 0-1) entered to face the top of the order. In a 2-0 count, 2B Dillon Persinger cleared the left field wall to give Lynchburg a 5-4 lead. The three-run shot from Persinger (1) was just the second home run given up by Fuentes this year. Meanwhile, the Lynchburg bullpen shut down Potomac's offense the rest of the way. RHP Micah Miniard (1-0), LHP Kyle Nelson, and RHP Jared Robinson (SV, 1) all combined for the final four innings en route to victory. Collins (1) added an insurance run with a solo home run in the eighth. With their backs against the wall, Potomac forced a decisive Game Five with a comeback victory against Lynchburg. Against LHP Kirk McCarty (ND), Potomac took a 3-0 lead into the seventh inning. DH Andruw Monasterio connected on a solo home run (1) in the bottom of the second and 1B Aldrem Corredor and Banks picked up RBI base hits, a triple and a single, in the bottom of the sixth. LHP Nick Raquet (ND) was excellent in his first start of the 2018 postseason. The first-year P-Nat took a shutout into the seventh inning but ultimately was pulled after picking up just one out in the frame. After Collins walked and DH Trenton Brooks reached on an error from 2B Bryan Mejia , Jose Medina was hit by pitch to load the bases. LHP Hayden Howard promptly entered the game and allowed a go-ahead grand slam to CF Austen Wade (1) to give Lynchburg another late-game lead. In Game Four, however, the Potomac offense immediately fought back, tying the game in the bottom half of the inning. With runners on the corners and two outs, 3B Ian Sagdal evened the score with an RBI single, scoring LF Jack Sundberg , who led off the inning with a walk. Then, in the eighth, The P-Nats broke the game open against RHP Luis Jimenez (L, 0-1). Monasterio led off the inning by reaching on an error from Pantoja, hustling to second on the play. Banks and Sundberg both walked to load the bases, leading to C Jakson Reetz eventually getting hit by pitch to take the lead. With the bases still loaded and a 5-4 lead, SS Luis Garcia lined a two-run single to push the lead to three heading to the ninth. RHP Jacob Condra-Bogan (W, 1-0) picked up the final five outs of the game, striking out the side in the top of the ninth to preserve the victory. Both teams return on Sunday for a decisive Game Five to determine who will advance to the 2018 Mills Cup Championship. In the final game of the 2018 Carolina League Northern Division Championship, RHP Jackson Tetreault (1-1, 4.37) will take the ball for The Red, White, & Blue. Tetreault has faced Lynchburg twice this season, giving up nine earned runs over 10.2 innings on the mound. The Potomac offense will face RHP Eli Morgan (7-7, 3.91). The Lynchburg righty has also faced Potomac twice, giving up five earned runs over 11 innings. First pitch at Northwest Federal Field at Pfitzner Stadium on Sunday is set for 1:05pm. The Potomac broadcast will get underway at 12:50pm with the P-Nats Leadoff Show. You can listen to the Potomac broadcast at potomacnationals.com, at http://bit.ly/P-NatsBroadcast, or on the TuneIn Radio App.